Spain is the third largest producer of wine in the world after France and Italy. Most of of the country's wine production is from grapes such as Tempranillo, Bobal, Albariño, Garnacha (Grenache), Palomino, Airen, Macabeo, Parellada, Xarel·lo, Cariñena and Monastrell (Mourvedre). The most widely planted grape is the white wine grape Airén, prized for its hardiness and resistance to drop. It is found throughout central Spain and for many years served as the base for Spanish brandy. Wines made from this grape can be very alcoholic and prone to oxidation. The red wine grape Tempranillo is the second most widely planted grape variety, recently eclipsing Garnacha in plantings in 2004. It is known throughout Spain under a variety of synonyms that may appear on Spanish wine labels-including Cencibel, Tinto Fino and Ull de Llebre. Both Tempranillo and Garnacha are used to make the full-bodied red wines associated with the Rioja, Ribera del Duero and Penedès with Garnacha being the main grape of the Priorat region. In the Levante region, Monastrell and Bobal have significant plantings, being used for both dark red wines and dry rosé. Spanish wine laws created the Denominación de Origen (DO) system in 1932 and were later revised in 1970. As of 2009, there were 77 Quality Wine areas across Spain. In addition there is Denominación de Origen Calificada (DOCa or DOQ in Catalan) status for DOs that have a consistent track record for quality. The higher quality DOCa category has been awarded to Rioja (1991) and Priorat (2001). It requires lower yields and more rigorous selection of grapes. Each DO has a Consejo Regulador, which acts as a governing control body that enforces the DO regulations and standards involving viticultural and winemaking practices. These regulations govern everything from the types of grapes that are permitted to be planted, the maximum yields that can be harvested, the minimum length of time that the wine must be aged and what type of information is required to appear on the wine label. Wineries that are seeking to have their wine sold under DO or DOC status must submit their wines to the Consejo Regulador laboratory and tasting panel for testing and evaluation. Wines that have been granted DO/DOC status will feature the regional stamp of the Consejo Regulador on the label. The DO system is varied in its robustness, so the use of the term in itself has limited meaning and the name of the particular PO is considered much more important. Vinos de la Tierra (VdlT) - This level is similar to France's vin de pays system, normally corresponding to the larger comunidad autonóma geographical regions and will appear on the label with these broader geographical designations like Andalucia, Castilla La Mancha and Levante. Vino de Calidad Producido en Región Determinada (VCPRD) - This level is similar to France's Vin Délimité de Qualité Supérieure (VDQS) system and is considered a stepping stone towards DO status. Denominación de Origen (Denominació d'Origen in Catalan - DO)- This level is for the mainstream quality-wine regions which are regulated by the Consejo Regulador who is also responsible for marketing the wines of that DO. Denominación de Origen Calificada (DOCa/DOQ - Denominació d'Origen Qualificada in Catalan)- This designation, which is similar to Italy's Denominazione di Origine Controllata e Garantita (DOCG) designation, is for regions with a track record of consistent quality and is meant to be a step above DO level. Rioja was the first region afforded this designation in 1991 and was followed by Priorat in 2003, and Ribera del Duero in 2008. Additionally there is the Denominación de Pago (DO de Pago) designation for individual single-estates with an international reputation. Spanish wines are often labeled according to the amount of ageing the wine has received. When the label says vino joven ("young wine") or sin crianza, the wines will have undergone very little, if any, wood ageing. Depending on the producer, some of these wines will be meant to be consumed very young - often within a year of their release. Others will benefit from some time ageing in the bottle. For the vintage year (vendimia or cosecha) to appear on the label, a minimum of 85% of the grapes must be from that year's harvest. The three most common ageing designations on Spanish wine labels are Crianza, Reserva and Gran Reserva. Gran Reserva wines typically appear in above average vintages with the red wines requiring at least 5 years ageing, 18 months of which in oak and a minimum of 36 months in the bottle. Gran Reserva whites and rosés must be aged for at least 4 years with at least 6 months in oak. Ribera del Duero is a Spanish Denominación de Origen (DO) located in the country's northern plateau and is one of eleven 'quality wine' regions within the autonomous community of Castile and León. 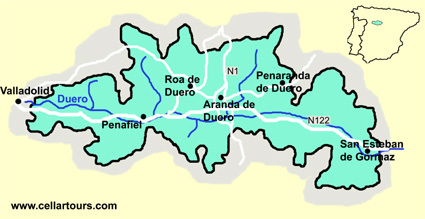 The region is characterised by a largely flat, rocky terrain and is centred on the town of Aranda de Duero, although the most famous vineyards surround Peñafiel and Roa de Duero to the west, where the regional regulatory council or Consejo Regulador for the denominación is based. 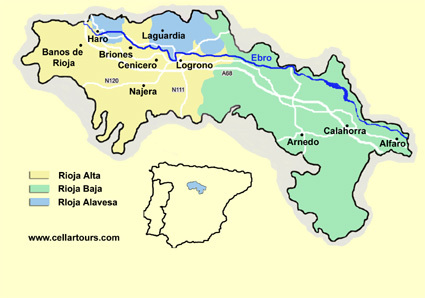 It is about a third of the size of the Rioja wine region. Ribera del Duero is home to the world-famous and highly-prized Vega Sicilia and Tinto Pesquera wines and is dedicated almost entirely to the production of red wine from the Tempranillo grape. Wines produced in the Ribera del Duero DO derive almost exclusively from red grapes. The Albillo grape is the only white variety grown, white wines being mostly destined for local consumption. The vast majority of production is dedicated to Tinto Fino (the local name for Tempranillo which is very popular in the northern half of the Spanish peninsula. The much smaller quantities of Garnacha (grenache wines) Cabernet Sauvignon, Malbec and Merlot are mostly grown to blend with the Fino, although the famous Tinto Pesquera, grown by Alejandro Fernández in Pesquera de Duero, is a 100% Tempranillo varietal wine. This was controversial to say the least, as the (possibly even more famous) Vega Sicilia wines traditionally followed the accepted blending with Merlot, Cabernet etc. popular in the neighbouring Rioja region. The combination of higher elevations, cooler climate and higher variations in daytime temperatures can give Ribera wines more colour, body and structure than Rioja. The best wines from the region come from the so called "golden mile" between Tudela de Duero (West of Vega Sicilia), Pesquera and Peñafiel. Vega Sicilia, the star of Spanish wine, uses Tempranillo as the main part of the blend (80%), together with cabernet sauvignon and some Malbec and Merlot. The wine has been called "Unico" with 6-7 years in oak, before bottling and with a 3 year wait for release. A second wine called Valbuena has Merlot not Cabernet Sauvignon in addition to the Tempranillo. Vega Sicilia was famous before the DO Ribera del Duero was created in 1982, but the winery decided to use the denomination. Other notable vineyards include Bodegas Pesquera with their top wine called Janus, a Gran Reserva and Abadia Retuerta which calls itself "El Pago de la Mille de Oro" (the vineyard of the golden mile). The Abadia vineyards are outside the DO Ribera del Duero as they are are in Sardon de Duero as so are labelled as Vino De la Tierra de Castilla y Leon. Rioja is a wine, with DOCa (Denominación de Origen Calificada) status named after La Rioja, in Spain.Though production is regulated by the Consejo Regulador which includes producers and growers, it is skewed to large producers whose concerns are not primarily quality in some cases. The 300 votes on the Regulador are divided according to size of production and the older, quality focused producers, have fewer than 10 votes. Rioja is made from grapes grown not only in the Autonomous Community of La Rioja, but also in parts of Navarre and the Basque province of Álava. Rioja is further subdivided into three zones: Rioja Alta, Rioja Baja and Rioja Alavesa. Many wines have traditionally blended fruit from all three regions though there is a slow growth in single zone wines. Rioja is mainly associated with red wine, but around 6% of production is white, mostly from Viura with some Malvasia and white grenache. Fruitiness comes from Tempranillo dominated Rioja Alta; acidity comes from the more elevated Rioja Alavesa and colour/body come from Grenache dominated Rioja Baja. The three principal regions of La Rioja are Rioja Alavesa, Rioja Alta and Rioja Baja with each area producing its own unique expression of Rioja wine. Located on the western edge of the region and at higher elevations than the other areas, the Rioja Alta is known more for its "old world" style of wine. A higher elevation equates to a shorter growing season, which in turn produces unripe fruit flavors and a wine that is lighter on the palate. Unlike the more continental climate of the Alta and Alavesa, the Rioja Baja is strongly influenced by a Mediterranean climate which makes this area the warmest and driest of the Rioja. A number of the vineyards are actually located in nearby Navarra and the wine produced from those grapes belongs to the Rioja appellation. Unlike the typically pale colour Rioja wine, Baja wines are very deeply coloured and can be highly alcoholic with some wines at 18% alcohol by volume. The wines typically do not have much acidity or aroma and are generally used as blending components with wines from other parts of the Rioja. Among the Tintos, the best-known and most widely-used variety is Tempranillo. Other grapes used include Garnacha Tinta, Graciano, and Mazuelo. A typical blend will consist of approximately 60% Tempranillo and up to 20% Garnacha, with much smaller proportions of Mazuelo and Graciano. Each grape adds a unique component to the wine with Tempranillo contributing the main flavors and aging potential to the wine; Garnacha adding body and alcohol; Mazuelo adding seasoning flavors and Graciano adding additional aromas. Some estates, Marques de Riscal most notably, have received special dispensation to include Cabernet Sauvignon in the blend, due to historical inclusion of that grape in their wine that predates the formation of the Consejo Regulador. With Rioja Blanco, Viura is the prominent grape (also known as Macabeo) and is normally blended with some Malvasía and Garnacha Blanca. In the white wines the Viura contributes mild fruitness, acidity and some aroma to the blend with Garnacha Blanca adding body and Malvasía adding aroma. Rosados are mostly derived from Garnacha grapes. Some of the most sought after grapes come from the limestone/sandstone based "old vine" vineyards in the Alavesa and Alta regions. The 40 year plus old vines are prized due to their low yields and more concentrated flavors. A unique DO regulation stipulates that the cost of the grapes used to make Rioja must exceed by at least 200% the national average of wine grapes used in all Spanish wines. A distinct characteristic of Rioja wine is the effect of oak aging. First introduced in the early 18th century by Bordeaux influenced winemakers, the use of oak and the pronounced vanilla flavors in the wines has been a virtual trademark of the region though some modern winemakers are experimenting with making wines less influenced by oak. Originally French oak was used but as the cost of the barrels increased many bodegas began to buy American oak planks and fashion them into barrels at Spanish cooperages in a style more closely resembling the French method. This included hand splitting the wood, rather than sawing, and allowing the planks time to dry and "season" in the outdoors versus drying in the kiln. In recent times, more bodegas have begun using French oak and many will age wines in both American and French oak for blending purposes. In the past, it was not uncommon for some bodegas to age their red wines for 15–20 years or even more before their release. One notable example of this the Marqués de Murrieta which released its 1942 vintage gran reserva in 1983 after 41 years of aging. Today most bodegas have shifted their winemaking focus to wines that are ready to drink sooner with the top wines typically aging for 4–8 years prior to release though some traditionalists still age longer. The typical bodega owns anywhere from 10,000 to 40,000 oak barrels. The use of oak in white wine has declined significantly in recent times when before the norm was traditionally 2–5 years in oak. This created slightly oxidized wines with flavors of caramel, coffee, and roasted nuts that did not appeal to a large market of consumers with some of the more negative examples showing characteristics of rubber and petrol flavors. Today the focus of white wine makers has been to enhance the vibrancy and fruit flavors of the wine. Some winemakers utilize a derivative of carbonic maceration in which whole clusters are placed in large open vats allowed to ferment inside the individual grape berries, without the addition of yeast, for a few days before they are crushed. Rioja red wines are classified into four categories. The first, simply labeled Rioja, is the youngest, spending less than a year in an oak aging barrel. A crianza is wine aged for at least two years, at least one of which was in oak. Rioja Reserva is aged for at least three years, of which at least one year is in oak. Finally, Rioja Gran Reserva wines have been aged at least two years in oak and three years in bottle. Reserva and Gran Reserva wines are not necessarily produced each year. Also produced are wines in a semi-crianza style, those that have had a couple of months oak influence but not enough to be called a full crianza. The designation of crianza, Reserva etc. might not always appear on the front label but may appear on a neck or back label in the form of a stamp designation known as Consejo. Oak is consistent in Rioja. Most at the Crianza level are matured in American oak bringing vanilla notes.